The Brown tree snake (Boiga irregularis) is an arboreal colubrid snake the lives in parts of coastal Australia, Papua New Guinea, and islands in northwestern Melanesia. This snake is known for being an invasive species, responsible for killing the bird population on Guam. 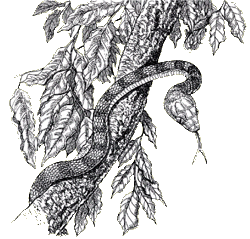 The Brown tree snake eats birds, lizards, and bats. It also eats small rodents in its home. It also eats birds and shrews at Guam. Due to the amount of prey and lack of predators in habitats such as Guam, they have been known to grow to larger sizes than their normal 1 to 2 meters in length. The longest recorded length of this species is one found on Guam was three meters. Reproduction has not been looked at in detail. The female makes 4-12 eggs, 42-47 mm long and 18-22 mm wide with a leathery shell. Females make up to two groups, called clutches per year depending on season, climate. and amount of prey. The female places the eggs in hollow logs, rock cracks, and other places where they are likely protected from drying and high temperatures. 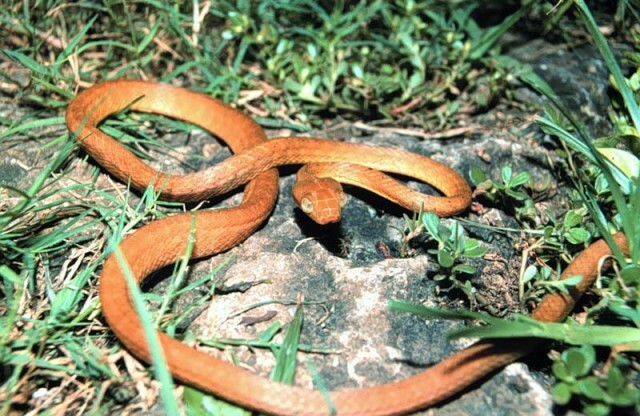 The Brown tree snake is a nocturnal snake that can be very aggressive when confronted. The fangs are grooved rather than hollow fangs, the poison is hard to place into a bite on a human, in this way, is only given in small amount. The venom appears to be weakly neurotoxic and possibly cytotoxic. Adults are not affectly in a great way, however, children are in greater danger. 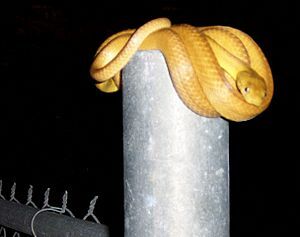 brown tree snake, Queensland, in characteristic "S-posture"
Brown tree snake Facts for Kids. Kiddle Encyclopedia.